The 500-seat Auditorium has a raked floor and concert lighting system. 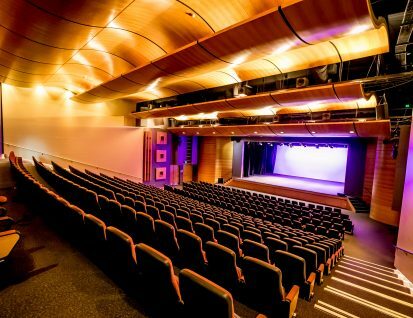 The fully-equipped performance stage incorporates an orchestra pit, excellent audio equipment and modern multi-media facilities. Each of the three rehearsal spaces is suitable for both small and large groups. The venue is managed by qualified staff who assist students in all aspects of stage, sound and lighting management learning. The spacious Foyer area, with Box Office, features floor to ceiling windows and provides the perfect venue for cocktail receptions, exhibitions, breakfasts, lunches and dinners. The Gallery provides a more intimate space for small meetings or functions. The covered outdoor deck is a multi-functional space for student activities or less formal functions. IPAC has a spacious bar and canteen facilities and is available for external hire subject to the College timetable.